Test specifications may well be a matter of personal interest and bias, but, given the choices made, whether or not an inference is warranted is not a matter of personal interest and bias. Setting up a test with low power against d’ might be a product of your desire not to find an effect for economic reasons, of insufficient funds to collect a larger sample, or of the inadvertent choice of a bureaucrat. Or ethical concerns may have entered. But none of this precludes our critical evaluation of what the resulting data do and do not indicate (about the question of interest). The critical task need not itself be a matter of economics, ethics, or what have you. Critical scrutiny of evidence reflects an interest all right—an interest in not being misled, an interest in finding out what the case is, and others of an epistemic nature. Objectivity in statistical inference, and in science more generally, is a matter of being able to critically evaluate the warrant of any claim. This, in turn, is a matter of evaluating the extent to which we have avoided or controlled those specific flaws that could render the claim incorrect. If the inferential account cannot discern any flaws, performs the task poorly, or denies there can ever be errors, then it fails as an objective method of obtaining knowledge. Consider a parallel with the problem of objectively interpreting observations: observations are always relative to the particular instrument or observation scheme employed. But we are often aware not only of the fact that observation schemes influence what we observe but also of how they influence observations and how much noise they are likely to produce so as to subtract them out. Hence, objective learning from observation is not a matter of getting free of arbitrary choices of instrument, but a matter of critically evaluating the extent of their influence to get at the underlying phenomenon. Likewise, the result of a statistical test is only partly determined by the specification of the tests (e.g., when a result counts as statistically significant); it is also determined by the underlying scientific phenomenon, at least as modeled. What enables objective learning to take place is the possibility of devising means for recognizing and effectively “subtracting out” the influence of test specifications, in order to learn about the underlying phenomenon, as modeled. Focusing just on statistical inference, we can distinguish between an objective statistical inference, and an objective statistical method of inference. A specific statistical inference is objectively warranted, if it has passed a severe test; a statistical method is objective by being able to evaluate and control (at least approximately) the error probabilities needed for a severity appraisal. This also requires the method to communicate the information needed to conduct the error statistical evaluation (or report it as problematic). It should be kept in mind that we are after the dual aims of severity and informativeness. Merely stating tautologies is to state objectively true claims, but they are not informative. But, it is vital to have a notion of objectivity, and we should stop feeling that we have to say, well there are objective and subjective elements in all methods; we cannot avoid dirty hands in discretionary choices of specification, so all inference methods do about as well when it comes to the criteria of objectivity. They do not. *Which, in turn, is a matter of my having overeaten in London. (1) If discretionary judgments are thought to introduce subjectivity in inference, a classic strategy thought to achieve objectivity is to extricate such choices, replacing them with purely formal a priori computations or agreed-upon conventions (see March 14). If leeway for discretion introduces subjectivity, then cutting off discretion must yield objectivity! Or so some argue. Such strategies may be found, to varying degrees, across the different approaches to statistical inference. The inductive logics of the type developed by Carnap promised to be an objective guide for measuring degrees of confirmation in hypotheses, despite much-discussed problems, paradoxes, and conflicting choices of confirmation logics. In Carnapian inductive logics, initial assignments of probability are based on a choice of language and on intuitive, logical principles. The consequent logical probabilities can then be updated (given the statements of evidence) with Bayes’s Theorem. The fact that the resulting degrees of confirmation are at the same time analytical and a priori—giving them an air of objectivity–reveals the central weakness of such confirmation theories as “guides for life”, e.g., —as guides, say, for empirical frequencies or for finding things out in the real world. 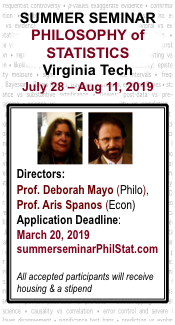 Something very similar happens with the varieties of “objective’” Bayesian accounts, both in statistics and in formal Bayesian epistemology in philosophy (a topic to which I will return; if interested, see my RMM contribution). A related way of trying to remove latitude for discretion might be to define objectivity in terms of the consensus of a specified group, perhaps of experts, or of agents with “diverse” backgrounds. Once again, such a convention may enable agreement yet fail to have the desired link-up with the real world. It would be necessary to show why consensus reached by the particular choice of group (another area for discretion) achieves the learning goals of interest. Likewise, routine and automatic choices in statistics can be justified as promoting a specified goal, but it is the onus of anyone supporting the account in question to show this. Carnap, R. (1962). Logical Foundations of Probability. Chicago: University of Chicago Press. Kyburg, H. E., Jr. (1992). “The Scope of Bayesian Reasoning,” in D. Hull, M. Forbes, and K. Okruhlik (eds. ), PSA 1992, Vol. II, East Lansing, MI: 139-52. Savage, L. J. (1964). 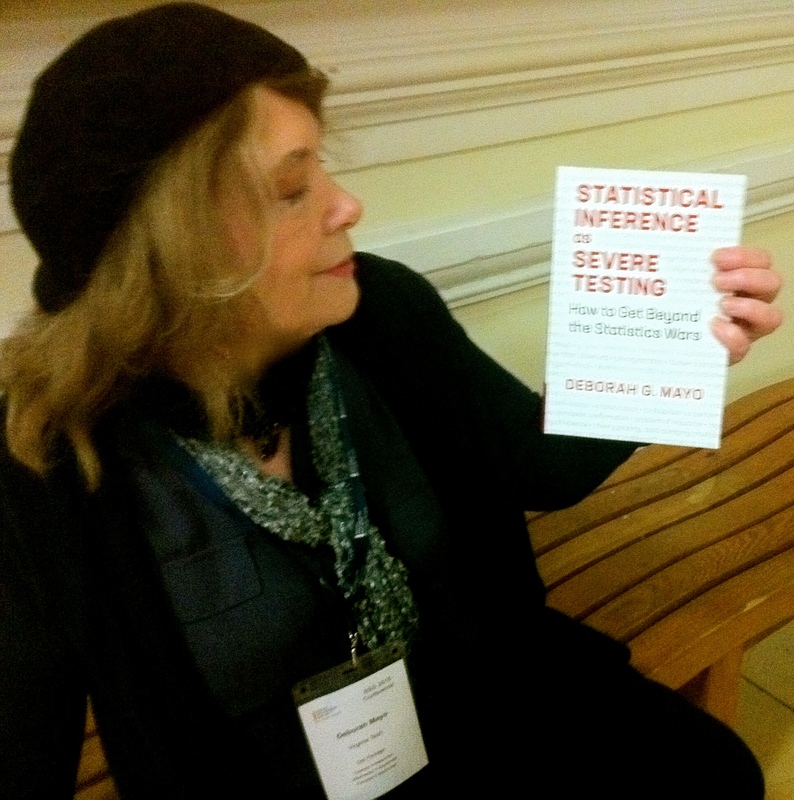 “The Foundations of Statistics Reconsidered,” pp. 173-188 in H. E. Kyburg and and H.E. Smokler (eds. ), Studies in Subjective Probability, Wiley, New York: 173-88. As you may have expected, I find this extremely interesting. I’m all for critical scrutiny of the evidence; I’m happy with most if not all that you advertise in the name of objectivity. Still, your text to me suggests a certain over-optimism regarding how far we can get “subtracting out” the effects of discretionary choices. I think that it is a legitimate use (one of the many possible and partly contradictory ones that one can find in the literature) of the term “objective” to say that it is objective what for example the result of a certain t-test implies and does not imply including an acknowledgement that this is based on the assumption of i.i.d. normality, which itself has to be open to critical scrutiny. However, there is no way, using methodology in a so-called “objective” way to distinguish normality and independence from every possible alternative that could potentially lead to substantially different conclusions regarding the underlying reality. At some point we always need to accept working with such a model having tested it in some ways and being not able to test it in some others. Where does this stand in your coordinate system of using the terminologies “objective” and “subjective”? There are certain possibilities even to analyse this, what potential problems it involves and how some of these (but not them all) can be dealt with, but often such possibilities (as in the robust statistics literature) come with the need of making further discretionary choices, tuning constants and the like. Personally, although I believe that you use the term “objective” in a consistent and legitimate way, I do believe that advertising objectivity in over-optimistic ways is very problematic in science and that there is a big problem with people trying to *appear* objective by hiding decisions from scrutiny some of which may be arbitrary, some of which may be sensible in their specific context although not generalisable, and some others of which may be absolutely required to get the statistical machinery (frequentist or Bayesian or whatever) going in the first place. I also believe that the wording “getting your hands dirty” conveys a bad message, namely that either people should clean their hands (i.e., appearing not to make decisions at all), or that once the hand are dirty, everything is possible – and arbitrary. As far as I understand you, you object against this idea as I do, but wouldn’t it then be helpful to have more positive and constructive ideas about how and why to make such decisions, and to encourage scientists to be open and honest about them? But this would require an acknowledgement of the benefits and necessities of such decisions and the rationales behind them, rather than talking exclusively about the “objective” side of things, only grudgingly accepting that discretionary decisions exist but should be “substracted out” as far as we can, wouldn’t it? What was my text to you? These are reblogs from the “objectivity” series (of 5 or more) from 3 years ago. Interestingly, I didn’t find there’s much I’d change, except that more needs to be said about the epistemology and metaphysics behind many existing positions on objectivity. The “dirty hands” analogy is one used by others in the risk assessment context to claim “we all have dirty hands”, thus we all are biased, thus scientists should bias their reports in favor of the common good (this was the ethics in evidence post, and this argument is more prevalent than ever.) I am arguing AGAINST the dirty hands allegation, so I am agreeing with you that discretionary choices don’t or needn’t dirty our hands. We all busy with too many opportunities to read too many things. But Christian’s recent paper with Andrew addresses many issue of objectivity very nicely. In that paper they reference Hasok Chang who seems very consistent with Peirce whom he seems to have gotten mostly from Amy McLaughlin (have to wait until I am at a library to access her work) and John Dewey – so you might be especially interested. Keith: Yes, I’ve written very lengthy and detailed comments on that paper. At some point, once cleaned up and provided the authors concur, I can post them. It just so happened to be a topic that coincided with my (end of the month) three-year monthly memory lane routine. I also know Chang well–a fellow new experimentalist who was one of the people I invited to my Lakatos Prize dinner. (I guess you’re allowed to invite some very tiny number like 3). He had published, in Nature, an early and very favorable review of EGEK (1996). First, Bayes has the property that you can subdivide the data/evidence in any way you want, and process it any order you want and you’ll get the same final answer. Frequentists methods do not have that property. It’s possible for two different Frequentists for example to get difference answers just because they did the same group of tests/severity analysis in different orders. Isn’t it important that methods be “objective” in this way, or do you think it’s acceptable that irrelevant choices by the analyst can change the import of the same data/evidence? A follow on questions: if being “objective” in this way is important, why can’t we use this a (mathematical) requirement to limit acceptable procedures? Do you have any idea what formalism you’ll mathematically be lead to if you start imposing these kinds of objectivity requirements? For logical probabilities the idea is that P(A|B) represents a model of the uncertainty in A from partial evidence B. The form of P(A|B) then follows logically and objectively from B. “A” could be parameters predicted or unknown or could be a frequency. For example, A could be the percentage of heads in the next 1000 flips of a coin. So where in the world did you get the idea that P(A|B) couldn’t be a “guide for life” because it’s “logical” and “objective”? BFL: Yes, Bayesians say they can toss things around, but many also say the prior is supposed to be before the data and not based on the data–warning against double counting. So their position is a bit unclear–doubtless it shifts for different Bayesians. If you’re alluding, at the start, to the fact that error statisticians violate the strong likelihood principle and that selection effects, stopping rules, multiple testing etc. alter error probabilities, then I say “guilty as charged”. That’s not irrelevant info for us. I mentioned the general key question raised of logical probabilities based on formal (first order) languages. A research programme essentially abandoned, but surely some still pursue it. One needs to set out all properties, possibly relations (I don’t think they’ve advanced to functions), individual entities, and then choose a “uniformity factor” lambda, and then a way to give initial assignments to states, or structures, or what have you. What you describe is in sync with having statements be statistical models, or in any event empirical and not purely formal, syntactical context-free claims. syntactic approach.